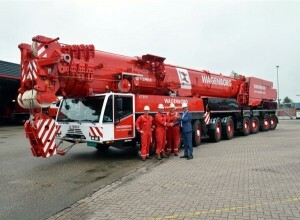 Dutch lifting services and heavy transport company Wagenborg Nedlift has strengthened its crane fleet with a nine-axle Demag AC-700 mobile crane featuring a 60m main boom. The 700t crane has already completed its first project – a tandem lift of an 185t hydraulic piling hammer with one of Nedlift’s 500t cranes. The hammer was lifted from a quay into an inland ship at the port of Eemshaven. Nedlift’s AC-700 specification includes 160t counterweight capacity, Sideways Super Lift and the possibility to add a 36m main boom extension and 50m fixed fly jib, as well as 96m luffing fly jib. The crane, to be used in the petrochemical, oil and gas industries, was supplied with an extensive safety package, including features like platforms and railings to work fully secured on top of the main boom and jib.